From your WordPress admin, click Appearance > Customize. In the Customizer, click the Menus tab. If your theme already has a default/primary menu, you can click on it to begin editing. If your theme doesn’t have a default/primary menu, click + Add a Menu instead. Type in a name for your menu, then click Create Menu. Page – Adds a link to another page on your site. Custom Link – Adds a custom URL linking to another site. Category – Shows a feed of blog posts from a given category. Tag – Shows a feed of blog posts from a given tag. Post – links directly to a blog post on your site. Click on the + Add Items button. Choose a menu item type from the list. For example: Pages. Select one of the options displayed for that type. For example, click + Home to add a link to your home page to the menu. You can also add additional items. In this case you could click + About to add a link to your About page to the menu. Note: If you wish to add a brand new page to your menu, you can add its title in the field for Add New Page. 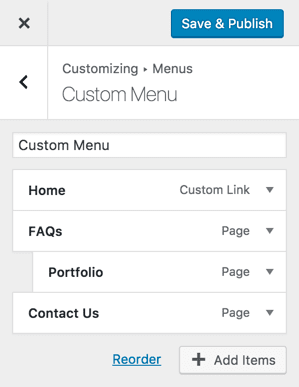 A blank page will be added to your site and automatically added to your menu. 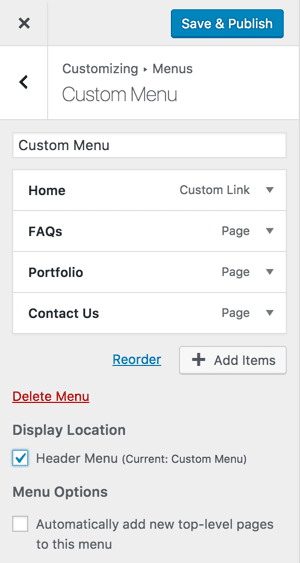 If you want this menu to display on your site, select a Display Location. For the main navigation, the correct setting depends on your theme. Often it is listed as Primary, Header, or Top. Click up/down arrows to move a menu item up or down the list. Click the left/right arrows to add or remove an item from a sub-menu / drop-down menu. You can also use the drag-and-drop feature. Click on a menu item, then drag and drop it directly beneath the main menu item you want it to be found under. To create a sub-menu / drop-down menu item drag and drop it again, this time to the right, so it indents beneath the main menu item. You can remove menu items by clicking on them in the settings on the left. When you do, they will expand and reveal a Remove button. Click that to remove the menu item. 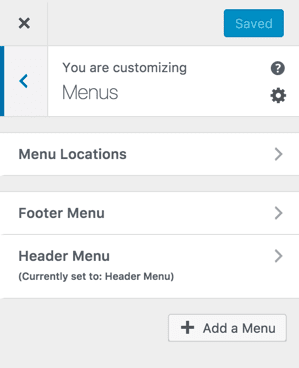 You can change the name of the menu item as it appears on your site by editing the navigation label. To do so, click on the item in the settings on the left side of the Customizer. It will expand and show a field for Navigation Label. Here, enter the text as you want this menu item to appear on your site. 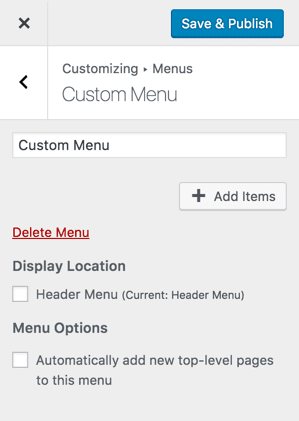 Once you have organized your menu, be sure to click the Save & Publish button to save your custom menu.